Firstly, I apologise for the lack of recent articles but now the football season has as good as begun and I am free for the rest of the year, I am back to regularly adding posts to the blog. In week one of the preseason, Charger fans learnt a fair bit about their team and what our fate may be come the end of the season. 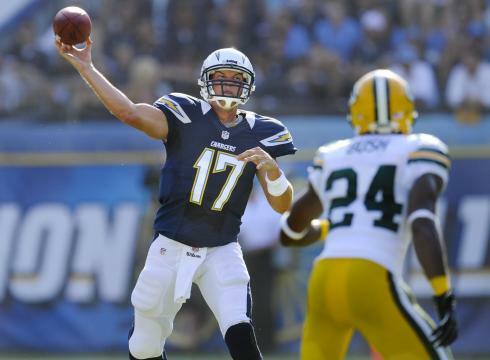 It is admittedly very difficult to judge a team's future on how they performed in the first week of preseason but what did we discover about the Chargers when they played Green Bay? Well, we learnt that yet again Ryan Mathews cannot stay clear of injury. On his first possession of the game he suffered a broken clavicle which is expected to take him 4-6 weeks to recover from. Mathews is said to be targeting a comeback against the Raiders in week one but whether that is realistic or not, only time will tell. This injury encourages yet more doubt as to whether Mathews' body can live up to the strains of being a top back in the league. Many NFL analysts had predicted a huge season for Mathews this year and if he gets back for week 1 or 2 the season could still live up to expectation. Overall you have to be pleased as a Charger fan that this happened week one of the preseason rather than week one of the regular season and I'm sure that Ryan will be determined to get on that field against the raiders in the opening game of the season. The rest of our offense seemed to perform solidly. Antonio Gates who said himself in training camp that he felt 100% fit put in an impressive performance and managed to link up with Rivers for a touchdown. This was a great site for the Chargers because if Gates can return to his usual self then there will inevitably be a much higher touchdown to field goal ratio as Gates when healthy excels in the red zone.Vincent Brown who had a promising season last year managed to gain 80 yards with four receptions. This will keep up the pressure on Eddie Royal for the third position on the depth chart and will likely lead to to the pair sharing time in the slot receiver position. As for Rivers he was fairly solid throwing both a touchdown and an interception but we will have to wait and see how Rivers performs when the pressure is on in the regular season before we judge how good he will be. The quarterback who most impressed me was Jarrett Lee who found his feat in the NFL very quickly. I admit he was against a second string defence but throwing for 235 yards and a completion percentage of 68.2 is certainly impressive. On the defencive side of the ball the Chargers impressed. Top rookies Melvin Ingram and Kendall Reyes sttod out with Reyes kicking off his sack total. Ingram went on a blitz against Aaron Rodgers on 4th and 2 and grabbed hold of him forcing Rodgers to chuck it straight to Cornerback Cason's outstretched hands. This play by Ingram should get the whole organisation exited. He ran past the left tackle like he wasn't even there and got straight to the quarterback. All I can say is to watch this guy and expect Shawn Merriman type performances out of him. So overall it was a good start to the preseason for the Chargers who will hope to have Mathews back as soon as possible and will want impressive rookies Melvin Ingram and Kendell Reyes to continue to get to the quarterback.